Analog Man - Superior Guitar Effect Pedals! You are here: Home > Search for "voodoo cable"
Analog Man carries the Voodoo Labs Standard 18" Cable. Standard 18" cable like those included with the Pedal Power 2. Has normal Boss style power plugs on each end, available with angle or straight ends. Analog Man carries the Voodoo Labs Standard 36" Cable. Extra long standard 36" cable. These usually come with one straight end and one 90 degree end for maximum flexibility. Analog Man carries the PPREV-R Voodoo Labs Reverse Polarity 18" Cable. We have these cables with 2.1mm right angle plugs on each end. This is the cable for the MOOGERFOOGER pedals and other reverse polarity effects pedals like Fulltone 69, etc. Analog Man carries the Voodoo Lab Y cable output splitter PPAV. Allows a power supply to power two effects, without ground loop problems. 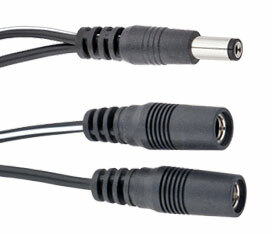 Analog Man carries the Voodoo Labs 24Volt DC E-H Y-cable. Allows the Pedal Power 2 to combine two 12V outputs to power EH pedals that require 24v, such as the Deluxe Memory Man, Deluxe Electric Mistress, Micro Synths, and the Q-Trons. Analog Man carries the Voodoo Labs 18Volt DC Y-cable. Allows the Pedal Power 2 to combine two 9v outlets to power effects requiring 18v. Does not reverse the polarity. 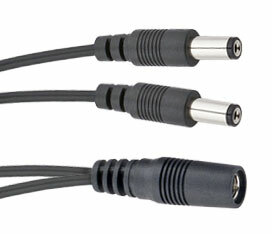 Analog Man carries the Voodoo Labs 1/8" Male End Cable. Allows the Pedal Power 2 to power older MXR and EH style pedals with power jacks that accept 1/8" male ends. Also the Klon Centaur, some Proco Rats, etc.